Over the next two years we will be embarking on an exciting project to improve the foyer area of the theatre, and small improvements to the auditorium and back stage areas. There are two ways that you can help us to raise the funds that we need to make this project a reality. Firstly. Make a donation to the theatre using the JustTextGiving system. 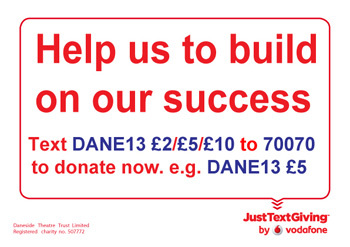 Just text DANE13 £2 (or £5 or £10) to 70070 to donate directly to our fund. This system does not take anything from your donation, and the full amount goes straight to us. Please don't forget to allow us to claim gift aid on your donation, it's worth a further 25%. Secondly, if you buy from Amazon, then follow the button link from this website to Amazon rather than going direct. By directing you to Amazon, we gain a payment of 5% of the value of anything you buy – and it costs you no extra. Thank you for helping us with our fundraising efforts, and watch out for updates on the website. 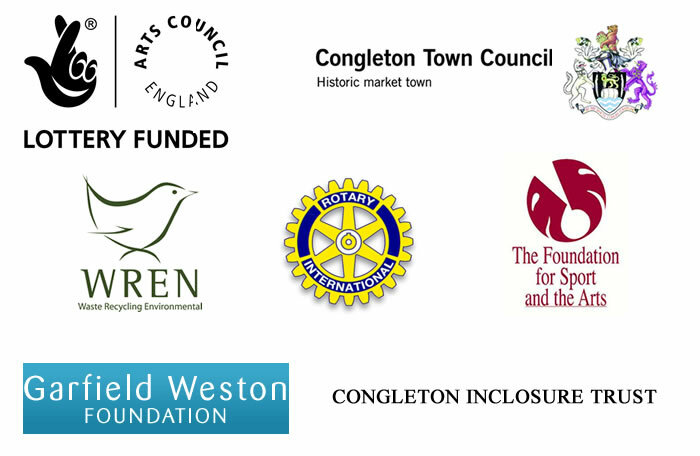 Daneside Theatre is supported by the Arts Council of England with National Lottery funds and through the Regional Arts Lottery Programme, WREN, the Garfield Weston Foundation, Congleton Inclosure Trust, Congleton Town Council, The Rotary Club of Congleton and the Foundation for Sport and the Arts. The Theatre, and all the societies that use the venue are staffed entirely by volunteers. We are always on the lookout for new acting and non-acting members for all the groups, as well as back-stage and front of house staff, committee members as well as people to help with publicity, box office and a hundred and one other jobs. If you have a few spare hours, contact one of the societies, or a member of the trust, and discuss what you would like to do, and we will put you in touch with the right group of people.